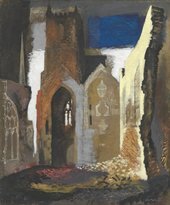 Join a guided tour of our John Piper led by the exhibition curator. Is there a better way to learn more about an exhibition? Darren Pih curator of John Piper at Tate Liverpool will take you on an intimate tour of the artworks on display in the gallery. We are in the process of updating our website and are currently unable to offer online bookings for this event. Please give us a call to book on 0151 702 7400 (9.00 – 17.00 daily). Event supported by Liverpool John Moores University.